Callum and Jack – tell us a bit about your respective roles in the band and how you came to be a part of it. Also can both of you give us a glimpse of your musical journey so far? JackΩ: This band started after the dissolution of the last band (Singer) Dean and I were in. Derek was a friend who we thought would perfect for the roll of drummer even know he had never played the instrument beforehand and Callum, Deans brother, was always around when we were rehearsing and somehow managed to sneak his way into becoming lead guitarist. CALLUM - In The Naked Feedback I’ve assumed the role of lead guitar in our recent songs. But between me and Dean (Lead Singer/ Guitarist), we do like to switch it up depending what is happening in the song. If Dean is singing more then I will tend to take more of the lead lines, or if I am running a few more effects or Dean has an interesting guitar line, then he takes the lead. The majority of the time we see that we have two guitars so we try and utilise them as much as possible. In terms of my musical journey, I’ve been a part of many projects, varying in different genres leading towards my current band. I can remember my first band as a teenager. It was a Screamo-Punk-Pop band. I never really liked the music we created. It just wasn’t me. However, I enjoyed performing with the guys I was in a band with. After I had left school, and the band, I started studying Music at Motherwell College which subsequently led on to joining other bands: a Classic Rock band, a Pop-Rock band, even a Rockabilly band to name a few genres. But when college finished, so did the bands. However, it was probably a year or so after that, I was working the bar one night in my work, when Derek, Jack and my brother, Dean, had put on a gig in my work. Dean had asked me that week if I wanted to join them onstage and play a song. Of course I said yes, because by that point I hadn’t played with a band since college had finished. We played “Sunshine of your Love” by Cream. From that point I got the bug again to play music. I think I pretty much begged them to take me on after that. The following month I played my first proper gig with them, and as of August this year that will be 2 years I will have been a part of it. Tools of the trade – Tell us about your favourite guitars/ basses, the one you go to first. What do you like about it above all others. And any close seconds? Ω: My favourite bass right now is the Fender Precision Bass. I had never really been interested in it before because I thought it was too common and not unique enough but after messing around on one in the studio I was amazed at how good it felt to play, how smooth easy it was and so recently I bought an all white one and I love it. I used it on our latest singles; “Who Is She?’ and “Rather Be Me” and I will most definitely use it throughout the recording of our next EP at the end of the year. It is definitely my go to bass right now. CALLUM - I’m a huge fan of Fender and Gretsch guitars. So much so, that I own one of both. 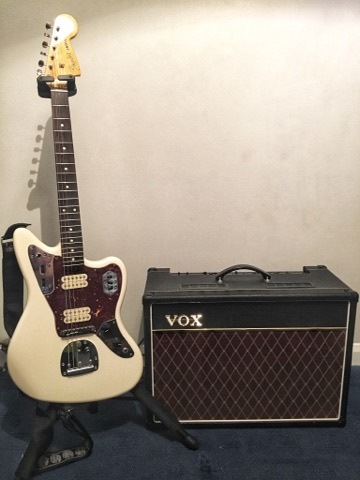 My go to guitar at the moment is my Fender Jaguar in white (however, it’s not as white as it used to be). It’s an amazing guitar that provides a huge range of tone capabilities. I really like the look of off-set guitars in general. There is just something different about them. It was one of the main reasons I got it: to be different but still maintain a useable sound. My close second is the Gretsch. It’s a hollow body with Blacktop FilterTrons. Plays very well however, I’m still getting used to the amount of feedback in generates. Not had a chance to break it in yet at a gig as it is a very recent purchase. However, it will get its first proper usage in the studio in December. The newer songs we have require that open body sound, so I can’t wait to hear how it sounds in the studio. A close second would be my Fender Reverse Jaguar Bass which I use exclusively in the live scene. It was the bass that really helped bring out the hard rock element of the band and its Humbucker pickups really punch through live and can keep up with our extraordinary guitarists. I used it on our first EP and you can really here the anger of the bass in that EP and its rawness. It’s quite unique and I've not seen another one around which suits me perfectly as I'm always looking for ways to stand out. There isn't really any guitars that got away, yet. I used to own an Epiphone Thunderbird but it really wasn’t the right bass for someone just starting out, it was top heavy and long scale and the action was set quite high. I would really desire a Gibson Thunderbird in Arctic White in the future because it's a real rock bass with the perfect punch from the pickups. I’ve decided my next purchase will be a Jazz Bass so look out for that in 2018. These go to 11 – what is your choice of amplification and given the chance what would be your ideal rig. Ω: My dream amplification rig would be Ampeg. The SVT series would be perfect. Ive seen many artists use this and I have always been blown away by the power and volume and tone of them. I fact my first ever concert was to see The Dead Weather and Jack Lawrence used the SVT series and to this day it is the best sounding rig I have ever heard. It left my ears ringing for literally two days. At the moment I'm using the Fender Rumble series which is such a clean sound, perfect for the clubs around Glasgow and its lightweight making it easy for transportation. My rig right now really works for us and I probably wont change it for a while, I have the right amount of volume and grit for the music we play. I am a big fan of combos but of course if I could have anything I would have the SVT Series head and 8x10 cab. I really don't care for digital modelling amps. I want my amp to do one thing and let me sculpt and change the sound using my pedals and guitars rather than having millions of sounds built into the amp. Old School. It just doesn't feel or sound natural to me and I really think theres nothing better than classic valve amps and Nuemann U87s. CALLUM - In an Ideal world I would love to own a Vox AC30 with Celestion Greenback Speakers, connected to a Marshall 4x12 Cabinet… All in Purple. The amount of noise it would be able to project would be unreal. The amount of cash I would need would also be unreal. Alas my current set-up has the Vox AC15C1 with the Greenback Speakers… In black. Great sounding amps: especially with the right guitar and pedal set-up. The Greenback adds a nice flavour to the sound compared to the Blueback speaker. You sacrifice volume having the Greenback, but Vox amps are notorious for being loud anyway so you don’t even notice it. With the Greenback you get those great jangly cleans as well as subtle fuzz tones when the amp is pushed. It works really well with my set-up, I couldn’t live without it. I’ve tried so many amps, but none give me the sound I need quite like Vox do. With the likes of Amp Modelling becoming more prominent I think it will open more avenues in the studio and in live scenarios. For a start it’s less to carry around. However, I don’t believe it will completely retire amps. Look at books, people still enjoy having the novelty of holding a novel in their hands or owning a physical copy. So long as people are either stubborn enough to refute new technological advances or just content in the tried and tested I think amplifiers will stand the test of time. To myself, whatever works best… works best. Effects and Pedals – the fairy dust sprinkled on top of most good guitar sounds. What are your current little boxes of tricks? Is there any that have survived on your board over the years? Ω: Guitar effects are very important to our band and we use quite a lot of them and both Callum and I are pedal Freaks. When I was studying Music Production I was told to buy a pedal every month just to build up a collection so that when you go into the studio you will have different options and a lot of variety of sounds. So I do have an ever growing collection of guitar and bass pedals. The current pedals on my board have been there for about a year now and I don't see it changing much in the near future except maybe the addition of a compressor and EQ Pedal. I wont give everything away but the two main pedals on my board would be my Way Huge Green Rhino IV which provides me with clear and angry overdriven sounds, built for guitar but perfect on bass. Its all over our records and will be for many years to come. Next would be the Way Huge Blue Hippo II. A chorus that can be heard best on our single “Creaking Floorboards”. It gives the creepy watery sound in the intro and really sets the tone for the song. There’s also a new song which definitely benefits from this limited edition pedal. Way Huge and the Moog Minifooger series are my favourite pedal manufacturers and I will definitely collect all the pedals by both companies eventually. Since we have been a band for a few years now we have no problem mixing the guitars and bass. We know how to sculpt our tones to fit together nicely when playing live and in the studio we experiment a lot with tones and EQs to get the best out of all the instruments. CALLUM - I am a huge fan of effects. My current board, as I am writing to you, has a tried and tested Boss Tuner, a Tonebender style fuzz, a toneshaper overdrive, Digitech Whammy, Dunlop Wah, Tubescreamer TS9, Earthquaker Bit Commander, Boss Tremolo, an MXR reverb, Way Huge Aqua Puss for analog delays, and a Strymon for every other delay imaginable. Safe to say it’s a heavy board. The two that have survived the longest are the Tuner and the TS9. A tuner is a tuner to me, so as long as it keeps on tuning I’ll never get rid of it. As for the TS9, it does everything I need it do. For as long as I have had it, it has served as a great solo boost. The way we have the band set up at the moment, it’s all about complementing each other’s sound. Whether it’s in the studio, or playing live, we make sure that everything sounds great. The last thing you need is all the guitars just sounding like they have been mashed together. Clarity is really important. Ω: For some players the little things definitely mean a lot but for me the string and cable brands don't matter. Currently I'm using the Ernie Ball Slinky Bass Strings, nothing unusual there. Although I am thinking about experimenting with Flatwound strings and I am currently reading up on them to see if I should or not.My bass straps are by Levy with a lightning bolt on them as a nod to one of my biggest influences, David Bowie.I don’t even know the brands of my Cables because I break them so often and it changes all the time. I ALWAYS use Dunlop Tortex plectrums at 1.14mm. They are the best and I’ll never use anything else. Also they are purple so basically they were destined for me. CALLUM - Strings… My brother and I always seem to snap strings when playing live. So we have learned to always bring plenty of spare strings as well as a spare guitar to keep us covered. Currently I use Heavy Bottom-Slinky Top Ernie Balls on all my guitars. I also couldn’t live without my guitar leads. I don’t even know which brand they are, but they are supposed to have a great longevity. I’ve have them for a year now, and they show no signs of wear and tear yet. And finally, which guitarist/bass player has caught your ear recently. What inspires you to keep playing and who was your first guitar hero? Ω: Im really into John Taylor for Duran Duran, I love his playing and I think he is an under rated player. Girls on Film and The Reflex are so much fun to play cause they are difficult and funky! Also, Bernard Edwards from Chic, he wrote some really memorable riffs and he has inspired me to learn more funk bass and try and sneak that into some new songs instead or just pure rock bass playing. I really like the Diana Ross album Nile and Bernard produced, “Upside Down” is my song right now. Tim Skold from Marilyn Manson will always be my main influence in image, attitude and rock style bass. Michael Schumann from QOTSA has produced his best bass playing on their new album “Villains” and he influences me a lot and I try to learn lots of his work, I do take bits from his style. Glasgow has a lot of great bands right now and the bassists are of a high caliber throughout the city which pushes me daily to be better and keep up with the rest. My first guitar hero is Jack White. Amazing. Unique. A God. CALLUM - My first guitar hero was Joe Satriani. When I was younger I bought an Ibanez similar to his. The amount of gruelling days spent trying to learn all the song s from Surfing with the Alien was hard work. But it has helped me become the guitarist I am today. At the present moment in time I’d have to say my current idle is Josh Homme. The man can do no wrong. Who else do you know can convince Iggy Pop to wear clothes?